CARLTON has left open the possibility of applying for a priority pick, despite declaring in May that would not happen. The Blues have had a dismal year, having won just two games. They were on the end of a humiliating 105-point belting at the hands of Greater Western Sydney last Sunday in which the Giants had no fit players on the bench for much of the second half, and for stints in the final term had 17 and then 16 players on the field. Nevertheless, GWS won that quarter by 39 points. Carlton chief executive officer Cain Liddle told Channel Seven's Talking Footy on Monday his team wasn't thinking about applying for a priority pick – at the moment. "As we've said all along, we're not putting any energy or time or focus into worrying about what is largely out of our control right now," Liddle said. "What we're worried about is trying to win games and trying to improve. The rule around special assistance clearly states that it's not even discussed until the end of the home and away season, so right now, all we're focused on is trying to win games." Earlier this year, Liddle said the Blues wouldn't seek a handout. "We feel we're in a good place and on the right track, so a priority pick is something we're not considering or interested in," he said. "Putting our hand out is something I'm not comfortable with. "We've got a plan and when you've made savage list cuts like we have in the past few years, you've just got to expect what we are going through now. "What we didn't plan for was the array of injuries we've managed to receive this year, which has just increased the instability on the field. "We're really confident in the plan and the kids we've brought in, but it just takes time for the kids to develop." Carlton has not finished outside the bottom six since 2013. AFL boss Gillon McLachlan told Talking Footy the Blues would need to ask for a priority pick if they wanted one. "It's certainly by convention that clubs nominate or request a priority pick, and I think that convention should apply. I've had the guys look at the rules and technically clubs don't need to, but I think convention applies," McLachlan said. 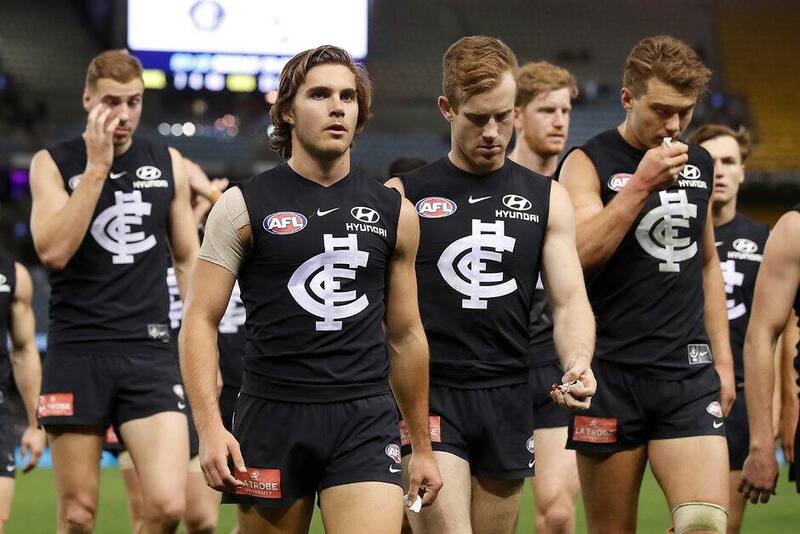 McLachlan wouldn't have a problem with Carlton changing its mind about it wanting assistance at the NAB AFL Draft. "We've been having ongoing discussions with them. They very clearly want to get through and focus on football until the end of the year and I think the door's open then to change their position or have a conversation with us, like they've been doing," McLachlan said.